Are you taking your driving test soon? 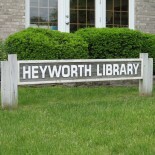 Thanks to a partnership with Driving-Tests.org, Heyworth Public Library offers free online test prep for students preparing for their IL driving tests. This resource is also great for anyone looking to brush up on their knowledge of Illinois’ traffic laws or interested in getting their CDL or motorcycle license. Find practice tests and answers to frequently asked DMV-related questions by checking out this resource.